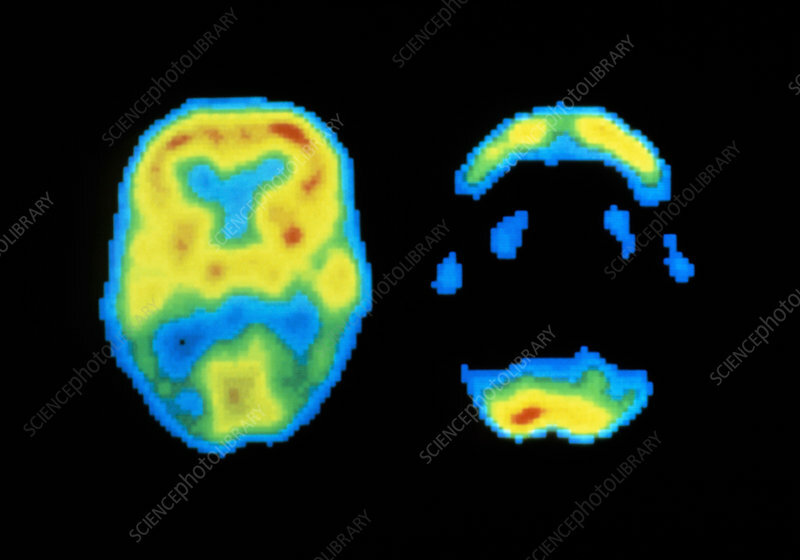 Images of the brain of a normal person (left) & someone suffering from dementia, produced using positron emission tomography (PET). The contrast in colour between the left & right images illustrates the difference in metabolic activity between the normal & diseased brain. The term dementia describes a chronic & persistent mental disorder caused by organic brain disease. Symptoms include memory loss, personality change, impaired reasoning ability & disorientation. Dementia may arise in the very elderly (senility) or in younger people (pre-senile dementia). The term is used to describe Alzheimer's and Pick's diseases.